The most recent additions to Vienna′s top-notch attractions were the new art museums of the Museumsquartier just behind the Kunsthistorisches Museum - and the opening of Austria′s most significant private art museum, the Palais Liechtenstein Museum, in 2004. Situated in one of the two (or actually three) Baroque palaces that the Royal family of Liechtenstein owns in Vienna, the museum presents the public parts of one of the most significant private art collections in the World. The items that are part of the exhibition actually make up only a small fraction of the entire collection, with the bigger share being locked away in Vaduz, the "capital" (ie. biggest village) of the joke-nation Liechtenstein. The palace itself is quite an attraction and would justify a visit all by its own - it makes a good opportunity to see a proper "Palais" from inside, one of the many "Vienna branches" of the Imperial nobility. The Liechtenstein family has been among the big earners of the Empire since its Baroque boom period, making them one of the wealthiest families in Europe - which they still are (or rather: which they are again now, after some troubled years in the early 20th century). At the peak of Austria′s post-Turkish-war-boom, in 1687, Prince Johann Adam Andreas von Liechtenstein purchased a garden with surrounding lands from Count Weikhard von Auersperg. On this site, the Liechtensteins built a palace on the southern edge and administrative courts on the northern edge - later, the entire site became part of a twin-palace arrangement similar to the Belvedere of Prince Eugen. 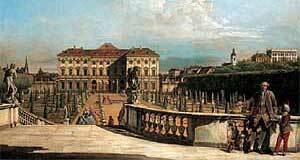 In 1688, a public competition was held to find an architect for the palace. Domenico Egidio Rossi won, but was replaced by Domenico Martinello in 1692. The style of the building follows Roman designs and is called a "Palazzo in Villa". It was considered to be rather conservative in its outlay, which matched with the taste of the Prince. The basic structure was outlaid in 1700. For frescos in the interiors, Marcantonio Franceschini was hired first, but he proved to be too slow for the busy prince. He was fired and replaced by Antonio Bellucci, who finished the job, apparently more efficiently than his predecessor. The central fresco in the main hall, the Herkulessaal, was painted by Andrea Pozzo, who died after the completion of his work. Since Bellucci had returned to Italy, the Prince had a beautifully painted first floor, but no painter for the ground floor. Austria′s most famous Baroque painter Johann Michael Rottmayr was finally hired - against the Prince′s initial intention to hire only Italian painters. In fact, the Rottmayr paintings are technically exceptionally good, but actually do stand out a bit and fail to blend into the over-all impression of the palace. The statues were made by a proper Italian (Giovanni Giuliani), and so was the stucco work (Santino Bussi). The gardens of the palace followed classic Baroque designs by Italian architects, but they were re-modelled into a neo-Classicist style by Joseph Kornhäusl in 1820. Continue with "Palais Liechtenstein Museum - Part II"